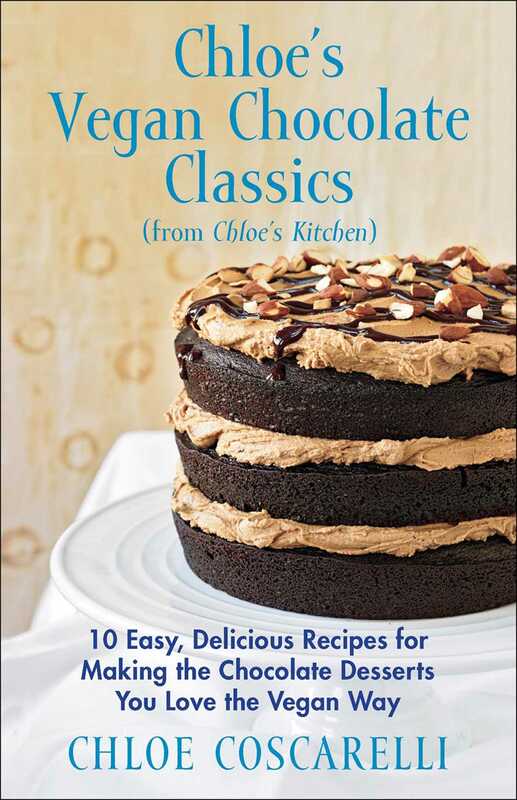 From Chef Chloe: an eBook collection of ten mouth-watering chocolate dessert and treat recipes from her wildly popular Chloe’s Kitchen that are delicious, crowd-pleasing—and vegan. Even before Chef Chloe wowed the judges on Cupcake Wars to become the first chef to win a reality TV cooking show with a vegan recipe, she was astounding her fans with her talent for producing delectable desserts without butter, milk, or even common vegan ingredients like egg substitute and bananas. Instead, her magic blend of liquid proportions and leaveners like baking soda and vinegar give her cakes a moist, irresistible texture and taste that neither vegans nor non-vegans can resist and her non-dairy secrets make her chocolate concoctions meltingly creamy and maddeningly addictive. In Chloe’s Vegan Chocolate Classics, you’ll find ten easy-to-make chocolate recipes collected from Chloe’s Kitchen and ranging from Mocha Almond Fudge Cake and Chef Chloe’s signature “Chlostess” Creme-Filled Cupcakes to her candy-like Buckeye treats—peanut butter balls dipped in chocolate—and Chocolate Chip Brownie Bites. She even includes a recipe for the best Hot Fudge Sundaes with Mint Chip Ice Cream. With gorgeous photos and clear-cut instructions, each dessert is sure to be a hit at holiday celebrations all year round.